Hard times require furious dancing! We are Anansi, a group of drummers, dancers and fire performers. We will be bringing the joyful rhythms of West Africa to create a sense of community between performers and the crowd. Looking for people prepared to work hard, get fit and become part of our lovely little orange cult. Dancers – No previous experience required but we require a high level of energy and a commitment to learn. 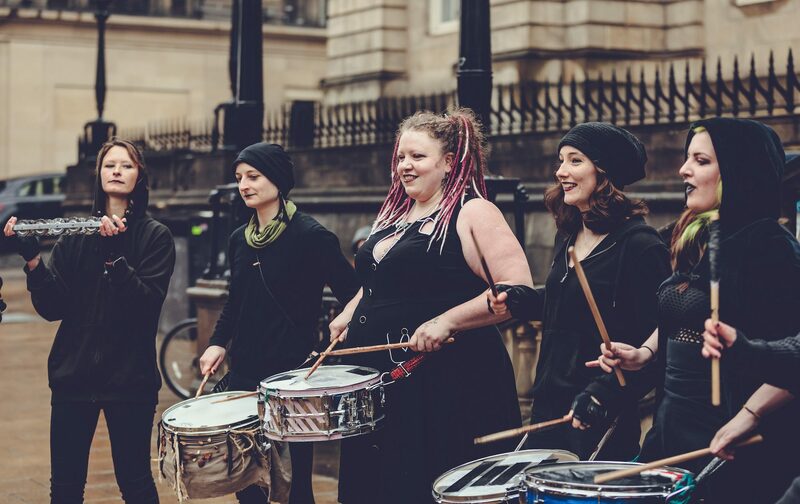 Drummers – We are looking for djembe players, stick drummers or percussionists. Again no previous experience required but sense of rhythm essential! Having lived in the mounds bound by the spiritual world for hundreds of years, the Sidhean are ready to explore the human world. During Beltane, the veil to the human world and the spiritual world is thin enough for all Sidhean to enter and attempt to regain the energy and power they once held when they lived alongside humans. They have formed a bond with Cambian Force who will ignite the elements through acro-balance, performance and theatre to the beat off Aos Sidhe’ drums, and will slowly gather the energy from the air, the water, and the burning fire. A beautiful exchange will begin to transform the Fearies to their great beauty and fill them with just enough to feel alive and free to roam. Their tired souls cleansed and ready to feed into the festivals ritualistic energy. Their time is short lived and will only last the night as their greed and gambling natures see them burn so bright and play so loud that there is no more left, and with the earth element missing from their force, they will return to their mounds. They will wait for the veil to become thin enough to pass once again where they will find a way to show off and beat their drums, searching for life and light in all things. 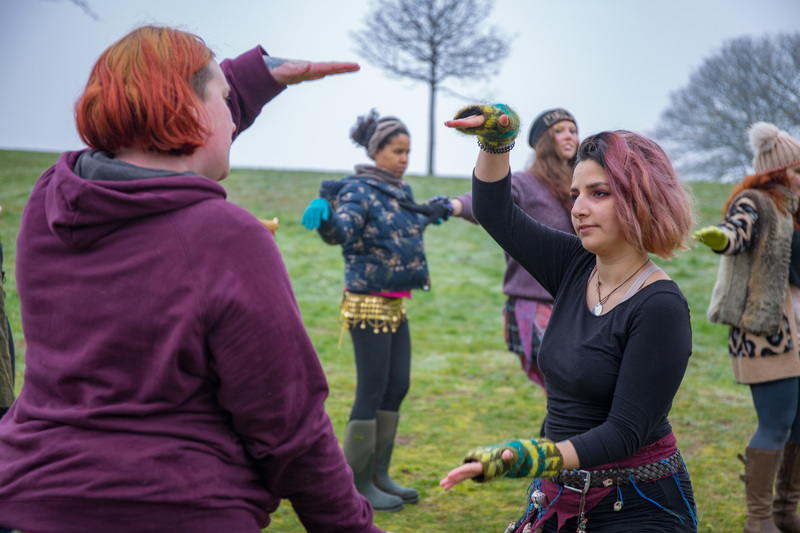 The Beltane Bees helper crew aims to pool the various resources we all have, to provide all sorts of logistical support to GOs and groups during March and April. There is no commitment other than “I am happy to be contacted with further info” – you choose your own involvement during the run-up. There is a high risk of tea and cake based meetups, albeit optional, and some Beltane-related workshops for the uninitiated or the nostalgic. Critters, creatures, things that go bump and rustle in the undergrowth; brought to life with animated, animalistic characters and a plethora of percussive devices. The heartbeat of the coming spring, the Beasties symbolise the emerging life and the driving rhythym of nature; a mix of tribal, contemporary and world drumming influences bring us together in a glorious cacophonous explosion! Vitality and rhythm! Drumming! More Drumming! Previous drum experience not necessary, but a commitment to learn and enthusiasm for a challenge is essential. This will be a life-changing experience for anyone taking part, just ask anybody who’s done it before, and the reward more than justifies the effort. The Bower is changing and will be more occupied with the ritual role of “Home on the Hill” and less involved as ‘catering point’. 0ur Bower group will build and hold the ritual space of ‘home’ to welcome the May Queen, the Green Man and the whole procession into our safe space as they complete their own journey through ritual space and ground those energies in celebration at the Bower. The Bower will be open all day on Beltane Eve holding quiet space for reflection. If this attracts you, maybe the Bower is for you so please do get in touch. To hold our space on Beltane night, the Bower group will make its own inner and outer journey in advance. 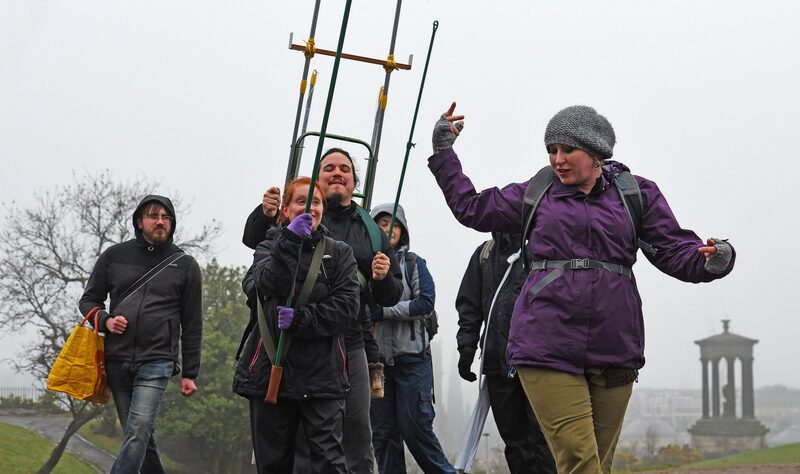 Following the theme shape of the celtic cross which is the path the procession takes around the hill, we will go to the north, south, east and west of Edinburgh, visiting sites held sacred in different traditions. There we will reflect on stories of how the divine feminine and divine masculine have danced in different representations through the ages and comparing our Beltane story in which they incarnate as May Queen and Green man on Beltane night. Every incarnation has met the needs of the people and the time. How will our Green Man and our May Queen meet our needs? How will we meet theirs? What meaning will we make of their dance? In the process we will complete our own inner journeys, considering what it is we hold sacred and how we relate to our sense of what is sacred in our own lives. By peacefully sharing our experience of the sacred as we know it, we will listen with respect to those who practice any spiritual tradition and none. All will be equally welcome at the Bower. If you want to explore, share and develop your sense of the sacred from any starting point. If you are drawn not to the divine masculine or the divine feminine but to the tension between them, if you are drawn to old places, quiet sharing, firesides – and of course cake 🙂 And most of all, if caring for others and community give you satisfaction, consider whether you are called to the Bower for Beltane 2014. PS We still love chocolate strawberries! Bud Om Brann are the Heralds of the coming Fire. We are a small group of only four members, and each member will embody one of the four elements. Our group has one main function, the call horn at the top of the Acropolis before the Procession begins. Our Herald (synchronised with four horns) will call the Four Winds to attention and announce the approach of the May Queen. This is a low time-commitment group particularly suitable to individuals with limited time to give in the lead up to Beltane. Cambium force an elemental group. We are looking for people who want to explore the elements and how to represent them in the ritual of the night and communicate them to the audience. If you’re ready to try something new, everything will be taught from the basics so no worries if you’ve not done any of it before. Ready to push yourself physically there will be exercise each practice. Ready to have some fun and probably be a bit silly. We are wisps. Always on the edge of sight, flashes of light in the dark night whispering and guiding you to places new and unseen. We shine in the darkness, always just beyond reach, but guiding you towards somewhere new. On Beltane night, released from our forests and bogs, we will be moving amongst the crowd explaining what is going on throughout the event, giving out leaflets and also explaining the overall story of Beltane this year. We will be whispering in people’s ears and drawing people away from the “obvious path” which is following the procession. The wisps will guide witnesses to either pre-empt where the procession will go (and therefore get ahead of it and see what is happening) or guide them to other activities that may be occurring on the hill throughout the night. We are the light, warmth and vitality of summer returning. We will be exploring themes of resurrection, rebirth, and new life in our performance. We invite new and experienced performers who want to play fire to join us and craft ethereal, bestial characters to portray these aspects of seasonal change. Come and celebrate with us as we move amongst the flames. With only Holly at his side, the Horned God has held fast against the wind, the cold and the dark. He is tired, bruised and bitter, turning to naive arrogance to aid his strength against the whirling maelstrom. But the land is changing. Memories of the seed, sprouting leaves and blossom begin to return, bringing with them a weakening of his mettle. Maybe he doesn’t know all there is to know about this world? He feels a calling, a yearning for the completion of his quest gnawing at him from a place deep within him he’d long since thought lost. He yearns to be stripped bare, to have his horns and winter cloak to fall away and remain where they were forged, for his kingly graces and form to dissipate with the life coming forth – there is learning to be done. Somewhere in the dew on the grass and the mist on the hills he sees her, feels her. She is in the trees, the rain, the earth and the air, and from her flows the spirit that resides in all he sees before him and all the lessons he is learning afresh. And so he goes to her, to show her how far he has come and all he has learned from and her world, how his horns have broken off and made way for her beauty. She sees his life, his soul and his eternity. She reaches for him, connecting with him and teaching him the final (or the first?) lesson. As he falls he realises this death is not passing away, but making way. She takes his hand and breathes into him life anew, and up he rises, taller than the Oak. He has seen the world through her eyes, with her help and her blessing. In that moment their beings entwined, and there they remained, ever-revolving and never-resolving. The fire arch stands dark and cold, awaiting Her return to bring new life again to the two worlds it bridges. The wheel has turned once more and the wait is over. At the heart of this gateway a vestige of its fire lives on within the breast of its guardian. As old as the arch, it remains at the boundary between the worlds. The wyrm’s heart burns as the sun in anticipation of Her return. Soon it will be time to light her way and welcome summer to the realms. The dragon dwelling within the arch represents our fear, fascination and reverence for that which we do not entirely understand but despite all our apprehension we still crave to connect to- a world beyond corporeality. Although the arch is a physical structure which the procession can pass through, it also marks a shift in the state of the characters as they move into a world where mortal bounds and perception no longer weigh on them. The dragon acts as a guide to illuminate the path to the other world, to challenge the strength and resolve of those that would enter to pass through the fire for renewal and transformation to begin in the other plane. The image of the dragon or wyrm conjures varied associations from fear through to a sense of something ethereal, wise and nurturing. This beast is the embodiment of the group’s collective creativity, stories and spirituality- just as dragons are a culmination of so many cultures’ fascination with the cryptic, ancient and mythical… fuelled by the imagination of hundreds of generations. The story, characters, the way they interact and their response to the movement of time are all to be developed by the group- as the giant dragon puppet takes form so does its character and significance to its makers. So simply… We are going to be making and operating a bloomin’ massive dragon puppet (hopefully fire breathing) whilst interacting with it, bringing it’s character to life. An excellent group for anyone fancying exercising their creative gland, working towards a big communal project and learning some new skills! Hillusphere are essentially a hill dressing group. They will be refurbishing props for the hill such as fire cans and stands, lanternholders etc. They will also be working to create new items of hill furniture, improving the atmosphere on the hill and increasing the things that the audience can see and get close to. The end products will be interactive photo opportunities for the public. The group, which will eventually merge into the main tech group, and like tech can also be open to members of other groups. The May Queen is an all encompassing character, uniquely personal to many, who symbolises Mother Earth from which all life force flows from Her and to Her. She personifies the cycle of the renewing seasons. Her face turned to summer, she awakens from the earth as a maiden figurehead. Abundant, strong and purposeful, she leads the Green Man into the underworld to shed his winter form and make a transformation through a death and rebirth ritual into the summer King. She accepts him as her consort and they enter into union allowing the new season to flourish. With her hands she lights the Beltane fire; marrying the Earth and the Sky, unifying all of us. please insert fruit when the light comes on. When the Veil is the thinnest we shall appear, with our tools of recording and no little fear. We capture the night howls, the dance and the trades, the fires, the rites and the old kings of days. We blend in to capture the most holy of rites – when the creatures that once fled come out on this night. So with photos we capture, when the Veil is but gone, the festival of creatures this world thinks withdrawn. 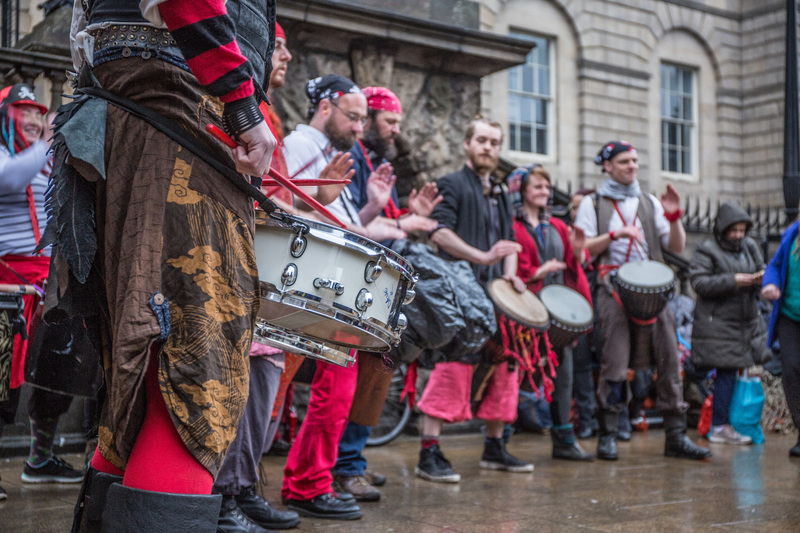 The first sound, where all other drumming at Beltane comes from – you know the festival has started when you hear the first hit of a stick on skin. The Processional Drummers provide the sound for the procession, supporting and giving audible power to the May Queen and the procession on their journey round the hill. The heartbeat and neverending pulse of the festival. A drumming crew who stick drum (snares, basses and floor toms) and play pounding full rhythms, some that will twist and turn and others that will simply make you dance, but all will be felt deep inside you. And all great fun to play. Drumming experience is not required, you will be taught from the basics and will quickly become proficient. Equally we would love to have you in the group if you are an experienced drummer and will be sure to challenge you! There is nothing quite like drumming in an 18 strong drumming crew. Red is pure desire given form. Not just sexual desire, but the desire that pushes all life to grow, to spring up from the ground, to feel the sun’s warmth, taste the air, explore its surroundings, learn, mature, seduce, fall in love, and make little versions of itself (that’s our favourite part)! Red is drive, impulse, energy, potential, and passion! We are young, wild, and free! Desire alone is chaotic by nature, our boundless energy lacks structure to contain it, it is wild and ephemeral. For life to take hold there must also be organisation, structure and wisdom… we see these qualities in the Whites and we are drawn to their focus and unity, in them we see a channel for our creative energy that will allow new life to flower forth! They are our greatest desire and we intend to romance and seduce them! We will be focusing on the use of acrobalance to express our creative drive and increasing maturity over the course of Beltane night, beginning with simple balances and creating ever bigger human pyramids! We are open to all levels of experience as we will be teaching acro skills from the ground up (literally)! We will also be expressing ourselves through intense movement and vocalisation, and will be a high energy group with a high level of physical activity. We are looking for enthusiasm and commitment above all and a willingness to push yourself, test your boundaries, try new things, work hard and have fun! The Stewards are the friendly but firm face of Beltane. We welcome the audience onto the hill, informing and guiding, and keeping everyone safe and happy through this celebration of the transition from Winter to Summer. As Stewards we have a foot in both this world and the ethereal one. With the Torchbearers we form the liminal boundary which escorts the Royal Procession on its journey. As the line between the performers and audience, we also get the best view in the house. If you haven’t got the time for making elaborate costumes or want to get your Beltane feet wet before jumping in head first, Stewards is the group for you. Aligned with neither Summer nor Winter, Torchbearers are mysterious black-cloaked entities on a mission to light the way for the changing of seasons. We carry burning torches (surprisingly enough!) and line the procession for the entirety of the festival with our glowy goodness. This means that as a Torchbearer, you’ll get a fantastic view of all the points and performances that the procession passes through, which makes us a great choice for people who are new to Beltane and want to see everything the festival has to offer. Watchers of the Sacred Fire will decorate the space around the bonfire and then stay and keep a vigil at the fire to watch it die down after the rest of Beltane have left the hill. We’ll use the fire to light lanterns which will be carried off the hill and brought back the next day for the clear up. Whites purpose is to surround the May Queen, to serve her, nurture her, and to protect her. They are extensions of her energy into the community, helping to restore the balance between human, spirit and the earth. By answering the May Queen’s call, they represent pure love, strength, wisdom, focus, balance and unity. They are her hand and shield, holding a safe space for her to do her work and journey. Having focus, structure, service, protection, love and grace as their compass, they choose to serve the May Queen, helping her in bringing forth the new season and in restoring the balance between darkness and light. The Whites are warriors and nurturers, their strength comes from pure love and the divine feminine, not fearing their vulnerability. In their hearts is the creative life force energy that drives them, bringing flowering fertility.